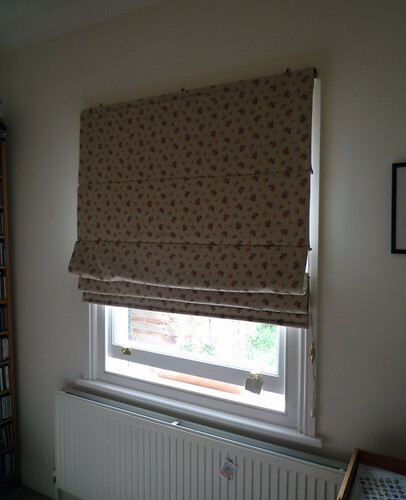 I have made my first ever roman blind. When the original line of ‘don’t buy one i’ll make one for you’ first passed my lips, i hadn’t quite anticipated the challenge i’d set myself. I think it the hardest thing i’ve done to date. Precision is key to this type of product as it involves ironing, pinning, ironing and pinning and ironing. Plus I was very aware that if I didn’t get the angles right then it would probably hang on a kink. Awkward! I’m very pleased with the end product and i’m happy to report that Kirsten (my housemate) is thrilled to have a replacement for the drab blind that was up in her room originally. I’ve said i’ll never do one again… until the next time! This entry was posted in Uncategorized and tagged blind by Sew Far So Good. Bookmark the permalink. that is *beautiful*, Soph. I’m jealous!